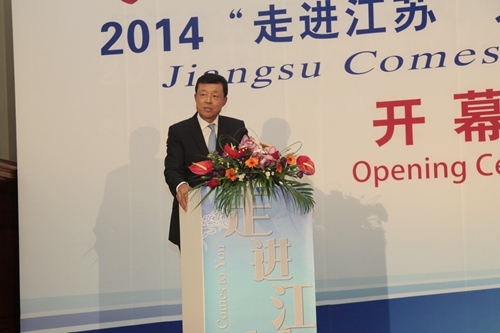 On 9 October, Ambassador Liu Xiaoming attended the opening ceremony of Jiangsu Comes to You 2014 and Yangzhou Day held by the Jiangsu Provincial Government at Central Hall Westminster in London and delivered a speech. Governor Li Xueyong of Jiangsu Province who was paying a friendly visit to the UK, Lord Sassoon, Chairman of the China-Britain Business Council, President Stephen Phillips of the China-Britain Business Council, Lord Wei, Member of the House of Lords, Gareth Ward, Deputy Director for the Asia Pacific region and Head of China Department of UK Foreign & Commonwealth Office, representative of Jiangsu’s sister county, Essex, and some 200 personages from the governments, economic, trade, technology, culture and other circles of the two countries were present. In his speech, Ambassador Liu Xiaoming said that among all Chinese provinces, Jiangsu is known for its long history and rich culture. It also excels in economy and high technology. Recent years have seen closer exchanges and cooperation between Jiangsu and Britain in a wide range of areas. In particular, Jiangsu leads China-Britain relations in three areas, business and trade, science and technology, and people-to-people and cultural exchanges. Governor Li Xueyong’s visit will further promote bilateral exchanges and cooperation in the three areas. At present, China-UK relations are on a fast track. We are working together to build a partnership of common growth and inclusive development. Against this background, this visit and Jiangsu Comes to You 2014 will further boost the growth of overall China-UK relationship. Ambassador Liu finally wished Jiangsu Comes to You 2014 a great success and wished more productive and fruitful cooperation between Jiangsu and Britain. 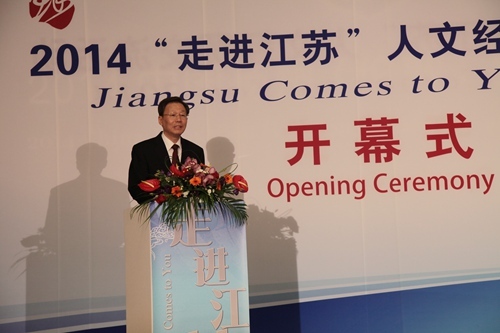 Governor Li Xueyong spoke highly of the friendly cooperation between Jiangsu and the UK in his speech and particularly introduced Jiangsu’s characteristics and advantages. He pointed out that Jiangsu is one of the highly opened regions in China with strong comprehensive strength and big development potentials. Jiangsu created over 10% of China’s economic aggregate with only 1% of China’s area and 6% of its population. Currently, Jiangsu is in a critical moment of the comprehensive deepening of reforms and accelerated economic upgrading and transformation. Jiangsu Comes to You is aimed at opening a window for friends from all circles in the UK to get a comprehensive understanding of Jiangsu, establishing a platform for the two sides to strengthen the exchanges and cooperation in various fields, and serving as a bridge to promote the friendship between the two sides. Gareth Ward, Head of China Department of UK Foreign & Commonwealth Office and President Stephen Phillips of China-Britain Business Council successively delivered speeches on behalf of the UK, noting that they were glad to see cooperation between the UK and Jiangsu go from strength to strength. Just as Prime Minister David Cameron and Chancellor George Osborne said, the UK is open to Chinese investment and personnel exchanges between the two sides. The UK will continue to deepen pragmatic cooperation with China. They hoped more enterprises in Jiangsu will come to seek business opportunities in the UK and hope more British enterprises will come to Jiangsu. 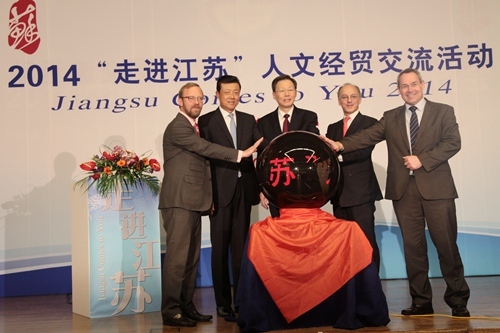 Jiangsu Comes to You is a comprehensive promotional campaign held in the UK by the Jiangsu Provincial Government and is also an important event for the provincial delegation’s visit to the UK. During the visit, a series of events were held including Jiangsu Investment in the UK, Jiangsu Cultural Temple Fair, Yangzhou Day and Ming: the Golden Empire exhibition showcasing a collection of original artifacts from the Nanjing Museum.